I do find myself cooking lots of Asian inspired recipes. 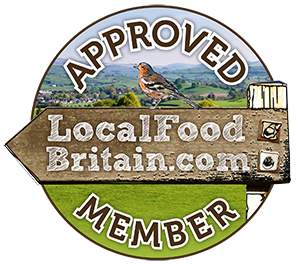 I suppose you could put it down to my addiction to chillies , fish sauce and lime. I have always loved sour and spicy flavours and Thai food seems to cater to my taste buds extremely well. The benefit of loving Asian food is that it is often very quick to prepare as long as you put in the hard work with the prep , most of which could be done in advance or , as with this recipe, just take a few shortcuts. My style of Asian cooking involves lots of quick stir frying and curry making for mid week speed and slightly more intricate recipes that I attempt at the weekend. What I love about Asian food is that it involves lots of bold flavours, but the food itself is light as long as you don’t always opt for the coconut based recipes! 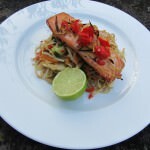 This recipe for Teriyaki style salmon with noodles is adapted from my favourite Thai food writer, Vatcharin Bhumichitr, for the noodle part of the dish. The noodles are equaly as delicoous on their own or served with Teriyaki marinated and fried tofu. 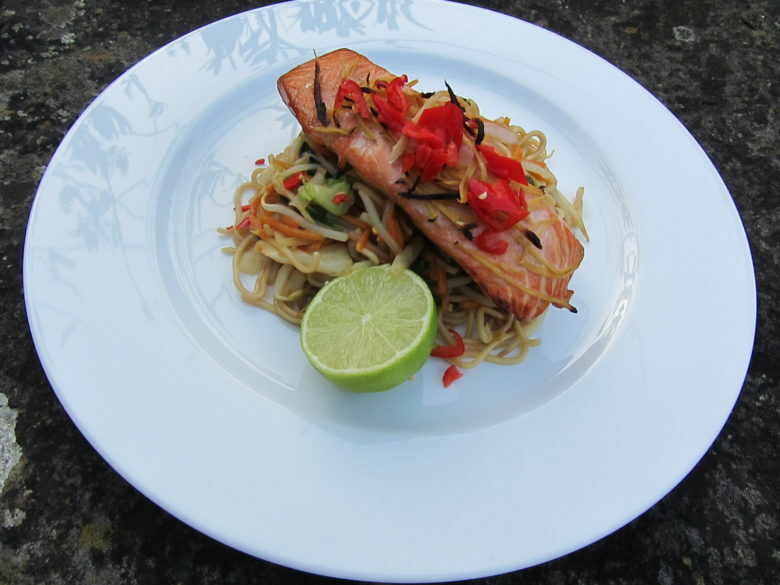 A Japanese influenced Teryaki style salmon dish best served with stir fried noodles.